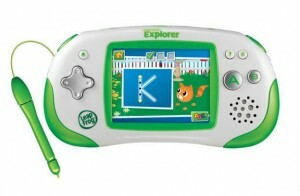 For LeapFrog, the answer is the newly announced $69 Leapster Explorer. For the price, the features are awesome. It has a nice color screen (3.2 inches and 320×320 pixels – which makes it a bit grainer than the iPhone, but a big improvement for LeapFrog) and 512MB of memory. It runs Flash (take that, iPad), will do 3D, and play video. A webcam attachment, due out later this fall, will cost $25. Both games and LeapFrog applets that are similar to apps on the iPhone will be available (in a proprietary format). The device is aimed squarely at 4-9 year-olds. Underneath the device lies a decision point in parenting philosophy. The Leapster Explorer has a vast network of educational apps that reside on LeapWorld. LeapWorld allows for avatars and personal customization – though no social networking. There’s a Learning Path online component that lets parents monitor activities, get suggestions for additional activities, and quickly find products that address a particular skill. Unlike earlier versions of LeapFrog apps, their new games and apps are much more fun, exploratory, and open-ended. Gone are the right vs. wrong answers and the whiny voices telling you “Good move” or “Try again.” The music is hipper and there’s a bit of a new edge. The underpinnings of what we used to call “drill and kill software” are eroding. LeapFrog’s apps are proprietary in format. There are both games – similar to Nintendo’s DS – and learning activities – more like the Apple Apps store. Launch titles include kid faves like Toy Story 3, Disney Fairies, The Penguins of Madagascar, X-Men, Disney Princesses, and Dora the Explorer. Pop culture at its best. While the $69 hardware is attractive, apps are actually more expensive than on the iPhone. While the Apple Store has no shortage of handsome 99-cent apps, the Leapster Explorer apps will be priced at $15 for two learning apps and for $25 a game. On the other hand, there’s a lot going on beneath the hood, tracking kids’ progress, and unveiling new games that make the additional price reasonable. Can LeapFrog’s earnest and right-priced approach to reaching kids from 4-9 work in a world where parents are handing over $500 iPads, iPhone Touches, and DS machines to four year olds? The alternative devices are much more facile and able to satisfy the whole family at once. LeapFrog’s Explorer is a platform built explicitly for young kids. At the moment, unfortunately, there’s no room for crossover. You can’t play LeapFrog games on an i-machine and you can’t play iPhone apps on your LeapFrog device. Sad. My bottom line? More price-sensitive, more traditional parents and those who believe that kids belong in a finite kids’ educational world will flock to LeapFrog. It’s also a fabulous solution for the less affluent who want a sustainable system through the primary school years. Parents who are less hierarchical and believe in a cross-generational approach will choose the iPad. Which are you? Think of it this way: When my kids were little, they had a toy vacuum. Playing with the real thing was not an option. The Leapster Explorer is an educational toy, albeit a powerful one. The i-machines are tools for grownups, with occasional kid uses. The Nintendo DS will always fare better at games than learning.